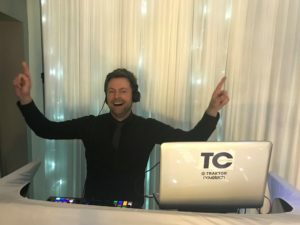 Tony has been been with PC Roadshows for almost 3 years, as a DJ and Host he boasts over 20 years experience. His younger years saw Tony working in Bars and Clubs through-out the UK. The last 10 years have seen Tony entertain, host and DJ all kinds of events and celebrations. He has the music knowledge, skill and experience to entertain what ever the occasion. Headphones on mixing ‘tunes’ at an 18th or 21st?…. No problem! Hosting an awards ceremony? Playing ‘Golden Oldies’ at a landmark anniversary. Tony will entertain young and old alike, create a fun party atmosphere and keep you dancing. Tony is also one of PC Roadshows Wedding Hosts. All PC Roadshows Wedding Hosts are highly trained, skilled and experienced to host your wedding day, planning with you to the finest detail he will ensure your day runs to ‘YOUR’ plans. With the PC Roadshows unique entertainment included Tony will make sure you and your guests are having an amazing day from ‘I do’ to ‘Goodnight’! A true professional, fun and outgoing Tony is guaranteed to give you a party to remember.